Duuun dun. Duuun dun. Dun dun dun dun dun dun. That’s because I know food cravings are lurking just beneath the surface ready to strike out of the blue and push me face-first into the nearest cake, carton of ice cream, box of cookies, bag of chips and pretty much else anything high in sugar, salt, fat and super-processed carbs. That’s just what happens when progesterone takes center stage in the second half of your cycle: This hormones wants you to eat high-calorie foods in case you got pregnant during ovulation and are now eating for two. 1. When tempted to snack, think of the long-term consequences of eating unhealthy foods: In a 2014 study from Brown University, volunteers were shown pictures of enticing junk foods (such as French fries, pizza and ice cream), then asked to think about the long-term health effects these foods would have on them, such as high blood pressure, type-2 diabetes and obesity. 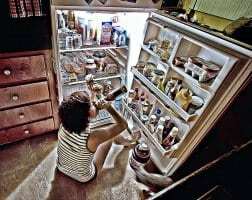 Using MRI scans, the researchers discovered that this long-term thinking approach spurred activity in a region of the brain involved in inhibitory control and self-regulation–traits that give you the willpower to turn down a high-calorie treat. 2. Rein in cravings by tapping your forehead for 30 seconds: Sounds too simple to work, but in a 2014 study led by the Director of the Weight Loss Program at Mt. Sinai St. Luke’s Hospital in New York City, study participants who tapped their forehead gently with their index finger for half a minute significantly reduced their food cravings. This method’s secret? Distraction. It stops you from thinking solely about your craving, which lessens its intensity. 3. Fade cravings by going to your “happy place”: Next time a craving hits, vividly picture yourself doing something you love, such as lounging on a beautiful beach or spending time with your family. Your food craving will lose its grip on you in minutes, according to a 2011 study in the journal Appetite. How it works: Picturing a pleasant scene in great detail stops you from picturing food, which diminishes your desire for it. 4. Avoid impulse snack shopping by munching an apple before you head to the supermarket: At some point during the second half of your cycle, you’re probably going to have to go food shopping. If you find it difficult to resist the bakery, chips and candy displays you pass by on these days, then a new Cornell University study reveals an easy solution: Eat an apple, a carrot, low-fat granola bar or other healthy food before you shop. You’ll be significantly more likely to veer away from junk food and add more healthy foods to your cart. Why? Eating a low-calorie, healthy snack before food shopping primes your brain to seek out more low-calorie, healthy options like it. 5. Look for healthy snack-alikes: Junk food isn’t the only way to satisfy cravings. Healthy foods that have the same taste, mouthfeel or nutrients your body wants can also fulfill food yearnings, making them pass–without the guilt. For instance: Craving fatty foods? Skip the buttery croissant and cheese and serve yourself guacamole or almond butter instead. Cravings sweets? Rather than chow down on a Snickers bar, enjoy a low-fat yogurt parfait or slice of watermelon. Craving salty snacks? Dodge the chips and pretzels and nibble a handful of roasted nuts. Craving carbs? Sidestep French fries and white bread and treat yourself to a delicious sweet potato or whole grain pasta. 6. Indulge–but only a little: Everyone knows the drill by now: If you cut out your favorite foods altogether, you’re just going to break down and eat double (who are we kidding, quadruple) what you would have ordinarily. Therefore, enjoy small portions of the foods you love. Just be sure to dole out the mini-sized portion (like two cookies or one scoop of rocky road) and put the rest away–far, far away–before you start eating.